2016 begins, as many years do, in JANUARY. For the Brighton Rockers the New Year nowadays means new blood, with the league using the winter to defrost their annual Fresh Meat intake. It’s another bumper crop of freshies. They’ll spend much of the year learning the sport, with many of them making their way into the B-team ranks in the summer and autumn. At least one will find herself invited to train alongside the A-team before the year is out. As baptisms of fire go, a six-team European tournament in Normandy ranks as pretty flamey, despite being held in the coldest hall on Earth. FEBRUARY‘s Slip It tournament in Caen sees several of last year’s Fresh Meat making their A-team debuts as part of a fairly makeshift Rockers squad (with a number of regular AllStars not travelling over). There’s a full report on Brighton’s three Slip It games in this thing we wrote so here we’ll just summarise. First up, at what feels like 6 in the morning, a bruising encounter with Brussels Derby Pixies. Scores are low and close in the first half as both sides shake their sleep out of their eyes, but the Pixies assert themselves in the second to win 217-121. 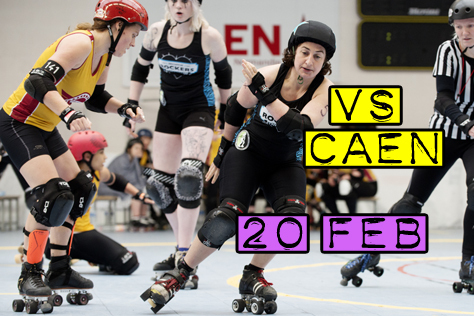 Next up for the Rockers are the hosts, Roller Derby Caen. The Leopard Avengers (to give them their Sunday name) have been the surprise package of previous Slip Its, performing well above ranking predictions, so by now people shouldn’t be surprised by the surprise. They roll over the Rockers 236-145, which means Brighton will face Eindhoven’s Rockcity Rollers in Sunday’s play-offs. This is the AllStars’ closest game of the tournie, with the Sussex skaters never more than a power jam behind, ending in a battling 140-167 defeat. Brighton will tempt Rockcity over to Haywards Heath later in the year in a quest for revenge, but the French trip ends with the Rockers finishing sixth from six in the tournament. Clearly they enjoyed it, though – or maybe realise they can’t do any worse – since Brighton will be taking part in the 2017 Slip It too. This is just a few weeks away (28th & 29th January) with opposition coming in the form of the Kallio Rolling Rainbow B-Team (Helsinki), Hellfire Harlots (Nottingham), Amsterdam, Madrid and the hosts. Keep an eye on this website for some sort of preview in the next few weeks. After their trip to Caen, 114 miles due South of Brighton, the Rockers keep things similarly simple on the compass front for their second road trip of the year, heading 54 miles due North in MARCH to face Batter C Power in Tottenham. The Rockers had narrowly beaten said London Rollergirls third team in Shoreham four years ago, but four years is a lifetime in derby and both squads are radically different for this belated rematch. Although the Londoners take a 172-132 victory (full report here) this is widely acknowledged – by Rockers fans as well as the skaters themselves – to have been Brighton’s best performance in a fair old while. Spring sees the league switch their attention from road trips to home events. Their first outing of 2016 at Haywards Heath Dolphin comes at the end of APRIL as the Rockers face the B-team of Newcastle Roller Girls. The Geordies’ A-team has already won this year’s British Champs title (with several months of the season to go) so their B-team are clearly going to be a challenge. Despite losing a few players to injury, Brighton take the game to Newcastle and roll out 170-143 winners (full report here). This marks the AllStars’ first victory in almost a year. The day also sees a narrow Rockerbillies defeat to the Hoodlum Gang, a 30th birthday celebration for Gin Atomic and a wedding proposal for Cake Or Death. 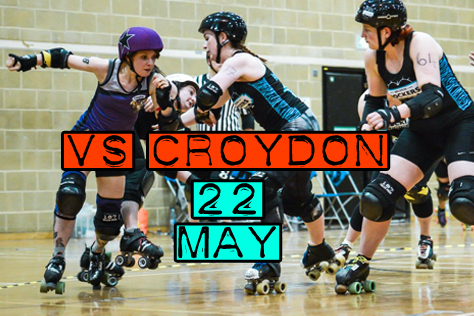 A mere three weeks later, in the merry month of MAY, the AllStars are back at the Dolphin to face long-time friendfoes Croydon Roller Derby. This game is part of the Brighton Fringe Festival and proceedings are suitably dramatic. The likes of Gin and Emma the Condemner give the Rockers an early 30-17 lead, but Dyduch and Agent Cooper hit back for Croydon, the latter taking advantage of a full Brighton penalty box to make it 38-31 to the visitors. The lead change seems to hit the Rockers for six as they suddenly stop picking up any points at all. All of a sudden the South Londoners are 74-31 up with ten minutes left of the half. Cometh the Hour, cometh Dr Whooligan, who trades power jams with Dyduch in a flurry of passes and penalties that finishes 20-4 (in points, not passes… or penalties) to the Rockers powerhouse. The fact that Whoolie starts the next jam in the sin bin doesn’t prevent her winning that ‘un too, 18-0 no less. It’s 69-84 on the totalisers now. Brighton’s bench crew are ordering in ketchup to eat up more of that Cronx lead. Or something similar which actually works as a metaphor. Imagine a clever line involving ‘Deliverooligan’ or something. You might have noticed that this end of year review has started getting more detailed (ie rambling) now we’ve reached the first of the games we forgot to actually write up at the time. Half time: 72-86. Second half. Second wind or seconds out? Pass and call from Skate Bush against Coop in the opener sees Brighton close it to ten points. Keeping it at that for a while. Hitt Bull and Inara Terra neutralising Dr W now though, Croydon pulling away 99-79. Emma off for a track cut next. CRD bench dude screaming at his pack to keep Shambolic separate from the rest of the Rockers defence as Dyduch makes it 111 for CRD. Gin pulling a whole bunch back for Brighton against her old teamies, but the gap is holding at a 20-ish tally. Both teams using time outs. Cake, Chaka Carnage and Sham throwing every hit they’ve got at Dyduch now, but she’s made out of concrete blancmange. …and leave things there. 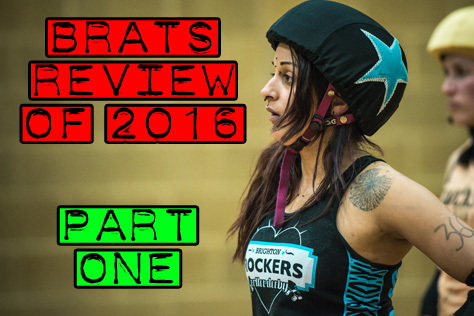 Keep an eye out for Part 2 of the BRATS Review of 2016, which encompasses the first ever Sussex derby derby (Brighton v Eastbourne), a double header against two challenging challenge teams, plus away adventures in the capital of Wales and the mysterious land of Houghton Regis. Yay! WTF! 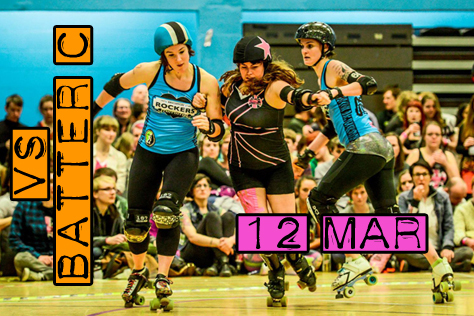 Roller derby is taking place in BRIGHTON – Actual Brighton – TOMORROW! 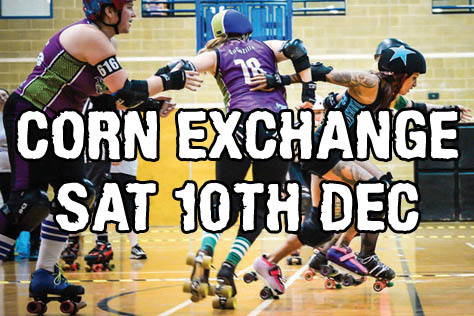 There’s a roller derby event in Brighton tomorrow (Saturday 10th December). Not just that, but in actual central Brighton, within a 213-year-old building in the Pavilion grounds at heart of the Cultural Quarter. No, we’re not imagining it. 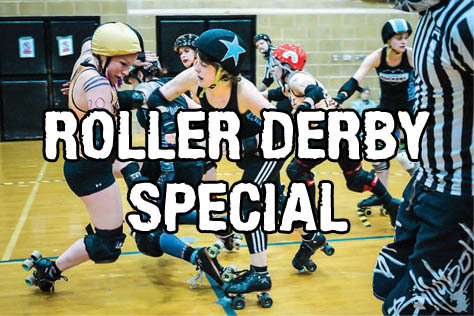 After seven years of playing in an old (now demolished) Parcelforce depot in Shoreham and a leisure centre in genteel Haywards Heath, the Brighton Rockers are finally fulfilling their long-term ambition of ‘doing derby’ in the city itself. 2016 has been the Rockers’ most game packed year on record, with fifteen open door A- and B-team matches against teams from half a dozen different countries. So you can’t blame them for wanting to round off the year by, er, playing with themselves. 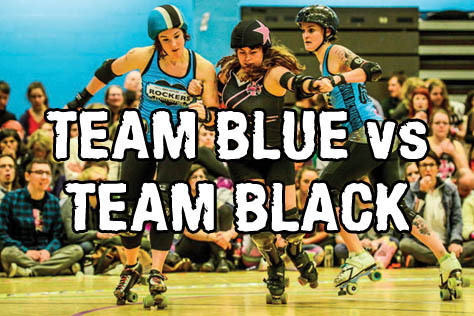 Tomorrow’s game at Brighton Corn Exchange sees the league split into two factions – Team Black and Team Blue – with veteran coaches Mass Janeycide and Mistress leading the two sides into uncivil war. 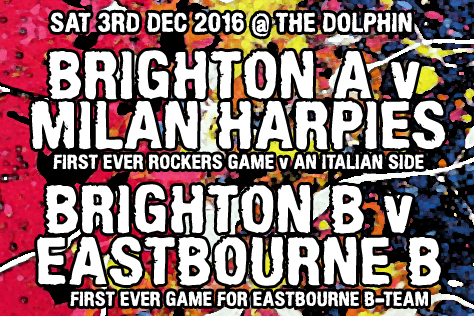 A mere three weeks after their last international encounter, the mighty Brighton Rockers AllStars are back in action at the Dolphin tomorrow (Saturday 3rd December) against the Harpies of Milan. This encounter – Brighton’s first ever against Italian opposition – is followed by a match between Brighton’s B-team Rockerbillies and the brand new Eastbourne Roller Derby women’s B-team, the Cherry Bombs. Doors are at 2pm with the first game kicking off around 2.30. Admission is £10 adults, £8 students and free for under 12s. The venue is located around seven minutes walk from Haywards Heath train station. Car users should point their sat navs at RH16 1LY. The venue has a cafe bar with booze, non-booze, hot and cold food, vending machines plus cupcakes in the hall. The nearest cash machine is at the big Sainsbury’s halfway between the station and venue. The pub opposite the station (Burrell Arms) is decent enough for a pre-game pint and the after party’s back in Brighton at the Temple Bar. Be sure to pick up a copy of our fanzine ‘Turn Left’ on the door. This issue covers both this event and the intraleague at Brighton Corn Exchange on Dec 10th. Our printers messed up the stapling/trimming of this issue a wee bit – unfortunately we went to print later than we’d like (due to waiting on a few replies) so there was no time for them to fix this. Ah well. You’ll also find a Player Of The Year voting form inside.